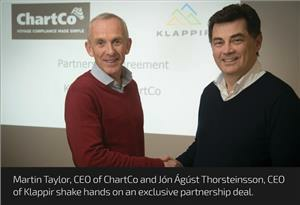 ChartCo and Klappir Green Solutions signed partnership agreement where the companies will market digital logbooks and software solutions for the global commercial maritime sector, within the ChartCo OneOcean platform. These will focus on the provision of reporting, monitoring, compliance and validation services. This move reflects ChartCo's ongoing strategy of simplifying the operation and management of commercial shipping. The ChartCo OneOcean platform is making a hugely positive impact upon the industry with its extensive breadth of applications - everything from fleet management and e-navigation to regulatory compliance and adherence to safety obligations, all within one solution. The addition of digital logbooks to ChartCo OneOcean's range of tools means that comprehensive ship data can be recorded in an environmentally-responsible manner, conforming to guidance from the IMO and MARPOL (the International Convention for the Prevention of Pollution from Ships). As well as recording a ship's position, course and distance traveled, electronic logbooks also catalog environmentally-sensitive aspects such as fuel usage and discharges, garbage disposal and greenhouse gas emissions. One of the immediate customer benefits is the fact that onboard data recorded into the digital logbooks will be automatically synchronized via the ChartCo OneOcean cloud, allowing shoreside management to monitor fleet activity, conduct trend analysis and benchmarking exercises, and submit records to regulatory authorities. Furthermore, logging data digitally both simplifies and shortens a complex and time-consuming manual process and helps to eliminate errors. More than 50,000 commercial ships are required to complete an extraordinarily large volume of logbooks. The inclusion of digital logbooks within OneOcean means that ChartCo is perfectly positioned to relieve ship operators of another burdensome task.